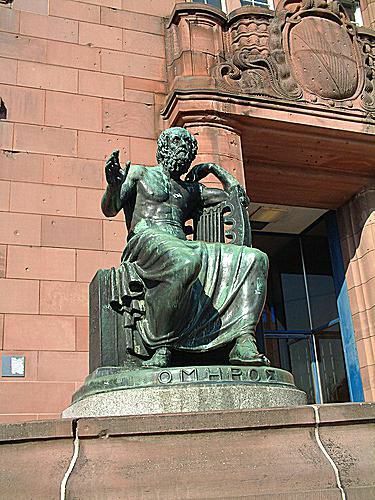 Homer Statue From Freiburg, Germany. Dactylic Hexameter is a very important meter in Greek and Latin poetry. It is especially associated with epic poetry, and so is referred to as "heroic". The very words "dactylic hexameter" often stand for epic poetry. Dactyl is the Greek for "finger". [Note: The Homeric epithet for the goddess Eos (Dawn) is rhododactylos or rosy-fingered.] There are 3 phalanges in a finger and, likewise, there are 3 parts of a dactyl. Presumably, the first phalanx is the longest in the ideal finger, while the others are shorter and about the same length, since long, short, short is the form of the dactyl foot. The phalanges here refer to the syllables; thus, there is a long syllable, followed by two short ones, at least in the basic form. Technically, a short syllable is one mora and a long is two morae in length of time. Since the meter in question is dactylic hexameter, there are 6 sets of the dactyls. _UU_UU_UU_UU_UU_UU. If you count, you'll see 6 underscores and 12 Us, making up six feet. However, dactylic hexameter lines can also be composed using substitutions for the dactyls. (Remember: The dactyl, as stated above, is one long and two short or, converted to morae, 4 morae.) A long is two morae, so a dactyl, which is the equivalent of two longs, is four morae long. Thus, the meter known as spondee (represented as two underscores: _ _), which is also the equivalent of 4 morae, can substitute for a dactyl. In this case, there would be two syllables and both would be long, rather than three syllables. In contrast with the other five feet, the last foot of the line of dactylic hexameter is usually not a dactyl. It may be a spondee (_ _) or a shortened spondee, with only 3 morae. In a shortened spondee, there would be two syllables, the first long and the second short (_ U). In addition to the actual form of the line of the dactylic hexameter, there are various conventions about where substitutions are likely and where word and syllable breaks should occur [see caesura and diaresis]. Dactylic hexameter describes Homeric epic meter (Iliad and Odyssey) and that of Vergil's (Aeneid). It is also used in shorter poetry. In (Yale U Press, 1988), Sara Mack discusses Ovid's 2 meters, dactylic hexameter and elegiac couplets. Ovid uses the dactylic hexameter for his Metamorphoses. Mack describes a metrical foot as like a whole note, the long syllable as like a half note and the short syllables as like quarter notes. This (half note, quarter note, quarter note) seems a very useful description for understanding a dactylic foot.